When traveling, food is not in the forefront most of the times. Seeing sites and trying to relax usually is. 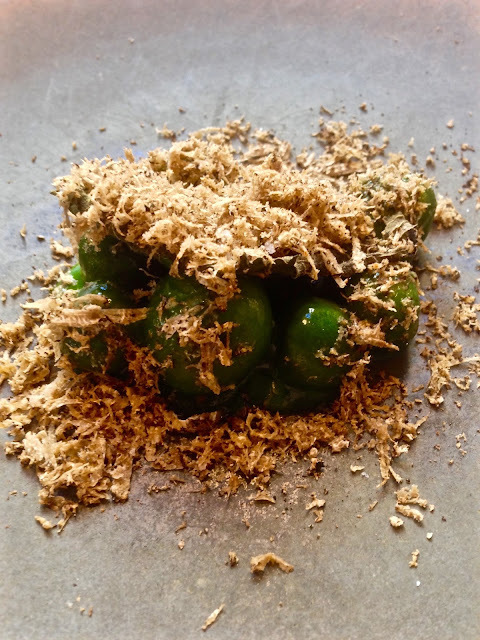 When we planned the trip to Scandinavia, it came to our attention after the fact that Copenhagen had 2 of the top 50 restaurants in the world in #3 Noma and #45 Relae. The SO looked them up and of course, at the late date, they were totally booked. Though each had "waiting lists" you could get on in case anyone cancelled their reservations. To be honest we really did hold out much hope but put our names on the lists anyway and jetted out. 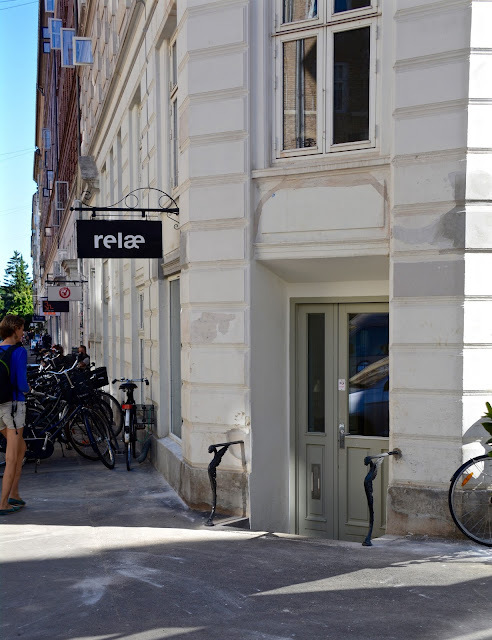 Then, while we were having a beer in a cafe on the canal in Stockholm (yes, I know how that sounds) the SO's cell rang, it was Relae calling to say they had an opening and were we interested. Through bad international connection we immediately said yes and booked our table for the following week at 5:30pm (the first seating) and were told we'd have the table for 2 1/2 hours. Really? Okay, then why not. Located in the Norrebro neighborhood of Copenhagen, it's a funky part of town with cute shops, trendy restaurants, etc. It's sort of like the Haight crossed with Hayes Valley and the Mission. They focus on sustainable food in simple fare. It was started in 2010 by 2 chefs who did some time at Noma, so they have some experience with this whole famous restaurant thing. After a full day of touring the city, we arrived early in our jeans and t-shirts as they said dress code was casual. Still, we were slightly concerned until 3 dudes showed up wearing shorts, t's and high tops, then we were good. They opened promptly at 5:30pm and we were ready and waiting along with a few others. It's a small narrow space with that whole stone, wood and metal vibe you could find here. The menu isn't really a menu. Basically you choose either the 3 course, 4 course or all 7 courses and then select whether to toss in wine pairings. Thing is, the actual food you are getting isn't listed. You kind of go with the chef's flow and the only thing you tell the waiter is how many courses and if you have any allergies. Seeing as how we'd probably not be coming back to Copenhagen anytime soon, we went all the way and got the 7 courses with wine pairings, duh. 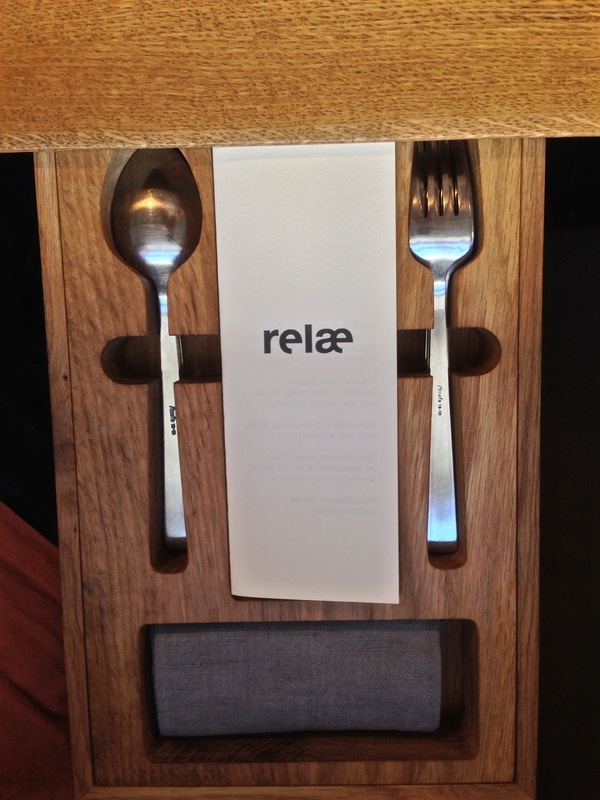 We start by pulling our own cutlery and napkins out of wood drawers in the tables. Felt like a table straight from IKEA. 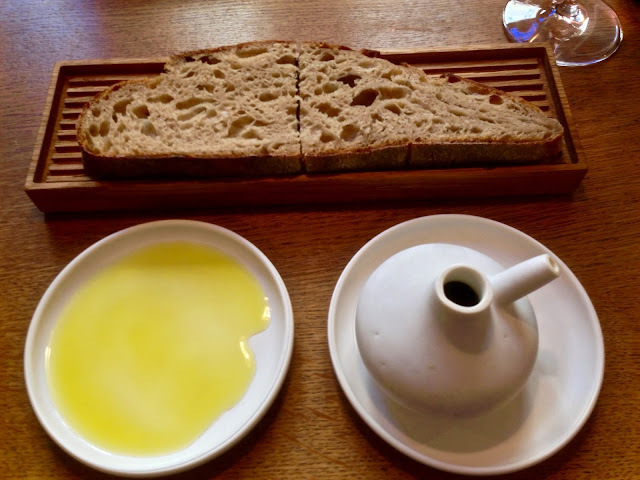 Surprisingly, they started us off with some sourdough wheat bread and fresh Italian olive oil. Yeah, it didn't come with butter, but I was okay with that--shock! The bread was warm and the oil tasted very green. It was very good bread that they kept bringing more of if we finished it. We tried to temper ourselves since we still had 7 courses to get through and we didn't want to fill up--or seem greedy. They kick it off with an amuse bouche, though it was more than a standard amuse bite full. Of note, is that each dish is served to your table by the chef who made/created it. Though the descriptions you get are just the basics of the plate, leaving our palates to try and suss out any added flavors or seasonings. It's fermented salad with goat cheese. 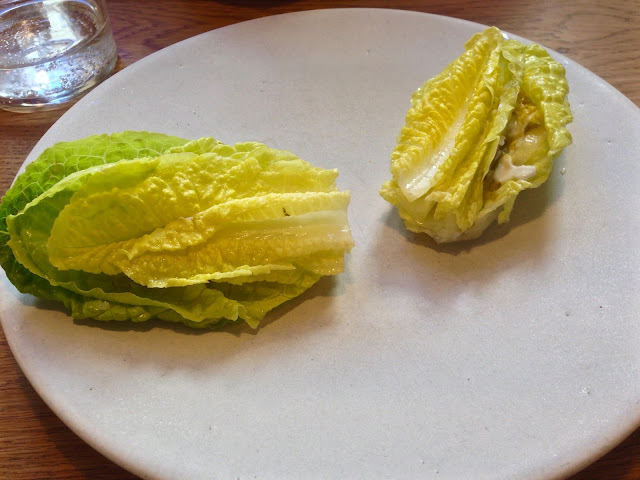 Warmed romaine lettuce with a smear of goat cheese and what tasted like pickled onions. Fresh, green, crunchy and salty, very salty. It was the first bite I got and while I could chalk it up to the goat cheese, it tasted more like it was added. A bit much, yes, though it wasn't through every bite so I wasn't totally overwhelmed by it. Interesting start. Green strawberries from last year and this year with onions and shallots. So far I'm gonna say green is the theme this evening, from ingredients to color scheme. The berries are finely chopped, close to macerated. It has a tang to it from the onions and under ripe berries. I think the liquid you see was juice from the berries, though it wasn't sweet. I was torn with whether I liked it or not. 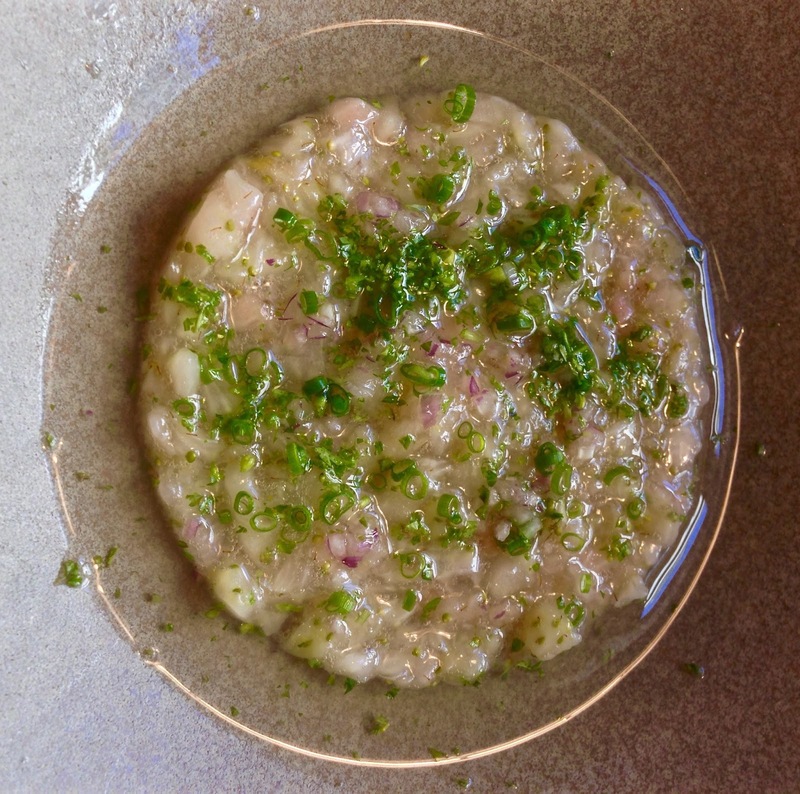 Interesting and simple yes, but elevated beyond chopped berries and onions? I don't know. It was paired with a very golden, slightly fruity white which was a good match to counter any bitterness, but still, it wasn't like we were wowed by this first course. 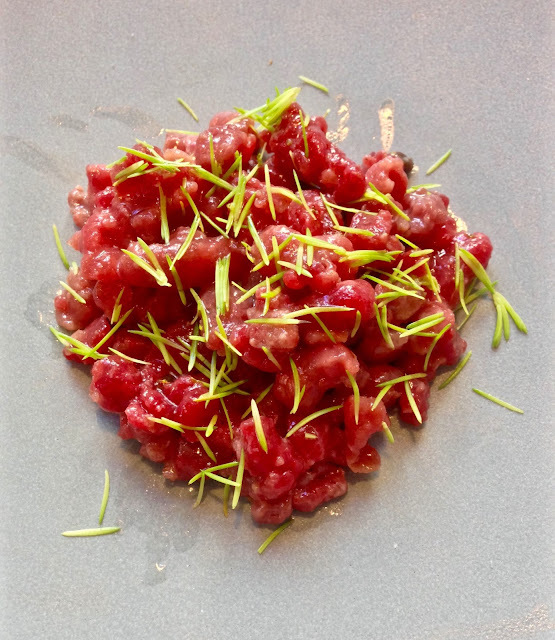 2nd course was venison tartar with juniper berries, pine shoots (green again! ), sautéed onions and chives--they are hiding underneath the meat. I like my meat cooked rare, raw however, is a real stretch for me, it's the reason I don't do sushi. But I dived in anyway. The meat was tender and not gamey as I realized I was eating deer again for like the 3rd time on this trip, it's going satisfy my need to ever have this again. I came across a berry or two but couldn't really taste them. 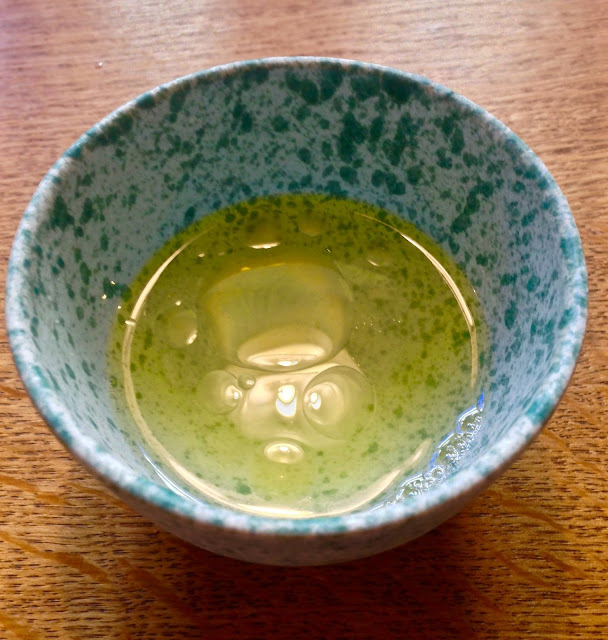 The pine shoots you could really taste, if you ate them by themselves. Otherwise, the meat was the thing here until you had it with the onions. Those two together were good and complimentary more so than the other two ingredients. Like the dish, yes, for the most part, even with my hesitations on raw meat. It's another dish with just the ingredients you see and no more. I did feel like it could have used a touch of salt though. Maybe pull some from the fermented salad? 3rd course, baby potatoes with morel shavings and stinging nettle puree sauce (green!). Now we are talking folks. Meet what I thought was the best dish of the night. The potatoes were cooked almost all the way done so they still had just the slightest soft crisp in each bite. The puree of nettles I'm pretty sure had loads of butter in it I could taste. It was like a baked potato. The morels added great earthiness and all the flavors just balanced and complimented each other. This was the simple 3 ingredient (possibly a butter 4th) dish that totally worked for both me and the SO. We loved it. Next up was not really a course but more a holdover till the next course was ready. It was the juice of an orange tomato with olive oil served as a refresher or palate cleanser or something. I wasn't really sure and to be honest, I was totally not feeling this at all. There was a lot of oil here and it just felt too slimy on my tongue and throat. Even with the addition of the tomato juice it was all a bit too viscous for me to enjoy. Fortunately they had just brought some fresh bread and I used that to cleanse before the next course instead. By the way, there was much more in this bowl cup than the picture belies. 3 actual courses down along with 2 additional dishes and bread! We'd been here over an hour and even though the portions are not huge (we'd been through 3 glasses of wine too) I stood up to take a little break. Which is exactly what I'm gonna do now and break this review into 2 parts. Stayed tuned--I've still got 5 more dishes to cover.